Now and then, it seems like some restaurants are getting a clue… perhaps they’re actually listening to some of what is being said. But oh my… we still have a LONG way to go to continue being educated. We certainly can’t let the restaurants do the math, and assume they have our best interests at heart. No, we have to consider what their objective is – for us to buy whatever it is they sell. It’s not ultimately for us to be healthy. But I’ll give them credit where it’s due, they’re at least TRYING. One of our kid’s favorite places to eat when we’re traveling (and if they’re in the area), is Culver’s. “Home of the Butterburgers”…. You can imagine how this sits with me. I used to LOVE their Wisconsin patty melts. (When I ate rye bread, slathered in butter… swiss cheese all melty and stuff.) Some days I even ordered a “double”… 616 calories and 35 g. carbs. Ouch on the calories especially. Now I just get a double butter burger with lettuce and mustard only – and eat it (without the bun of course). Sometimes I have a salad with it – no cheese, croutons or dressing of course… it fits the bill for A LOT fewer calories and carbs. Not the best choice – but much better for me. I was a little surprised that with their “Mindful Choices” options, they failed to offer something less of a 4″ white-bread bun! That’s 160 calories RIGHT THERE of no nutrition… Remember: Think! WHY am I eating this? What’s the point? Online Culver’s even has a “Nutritional Meal Builder” to give you the 4-1-1 on what you’re going to stuff on in, and pray it processes. They also have an allergen “grid” for their products. Very nice. 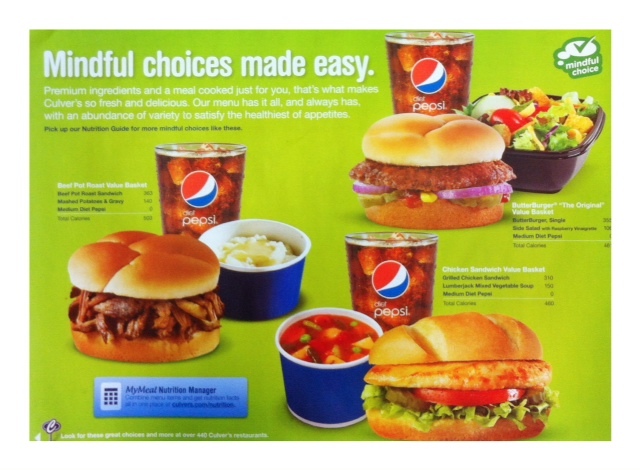 I think while their product offering is mostly of the “fast food” sort – they are trying to make better options available for their customers. That’s more that I can say for a lot of other companies! Just be more aware of what you’re eating. Don’t just 500 calories is what YOU should be eating at a meal just because that is their smallest offering. Most people need LESS than that. Posted on March 26, 2012, in Change, Diet, Food To Try, Label Reading, Our Struggles and tagged Calorie School, Culvers, drinking water, Fast food, gestational diabetes, healthy eating, losing weight, Patty Melt calories, portion control, post pardum weight loss, reasons to be healthy, Women Working Out, working out. Bookmark the permalink. Leave a comment.